Both of the Western Yellow-Bellied Racers (Coluber constrictor mormon) shown here were seen on the UC Natural Reserve Systems's Quail Ridge Reserve in Napa County, California. The Yellow-Bellied Racers are a geographic variant of the racer that is found in the Western US and the very southern edge of British Columbia. 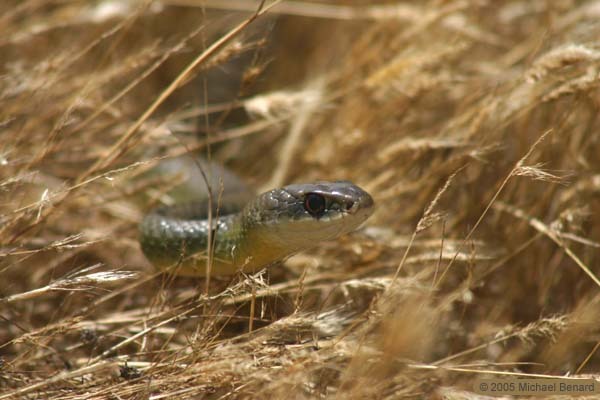 Other geographic variants of Racers, such as the Blue Racer, are found in the central and eastern United States, with a few populations in southern Canada. 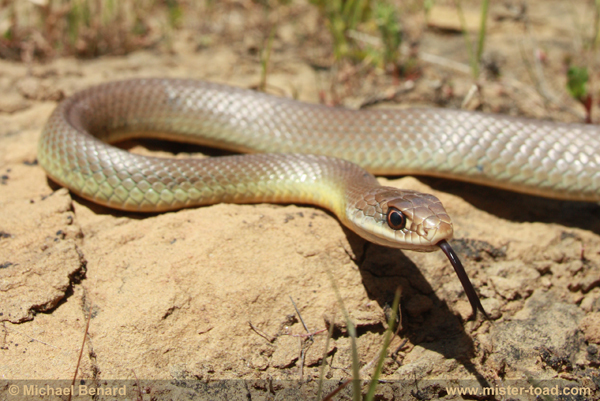 Western Yellow-Bellied Racers feed on a wide range of prey items. To learn more about their diet, Schewchuk and Austin (2001 Herpetological Journal) examined over 300 Western Yellow-Bellied Racers from British Columbia. They found that the vast majority of the snakes diet consisted of crickets and grasshoppers. However, the snakes also fed on rodents, snakes, and frogs.